Mariani Packing Company produces an extensive line of premium dried fruits sold in major grocery chains and delicatessens throughout the United States and worldwide. The company wished to extend brand awareness and introduce their award-winning new packaging designed by MRK Design Group of San Francisco. 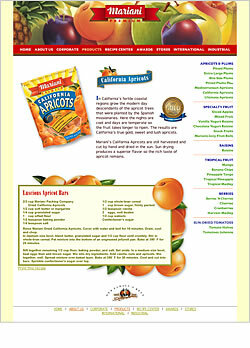 Working with MRK’s design concept and beautiful packaging graphics, Polaris Interactive produced a Web site that showcases Mariani’s products and provides mouth-watering recipes using their dried fruits.